At the end of a divorce case all community property is generally split equally between the parties and all separate property will be confirmed to the owner. Community property is defined as all accumulations and earnings acquired by either spouse during marriage. Separate property is defined as all property acquired prior to marriage, post-separation, by gift, by devise, or by bequest. However, this typical division of property and characterization of assets becomes more complicated for divorce lawyers when the parties have commingled or mixed community property with separate property. This is often the case if the parties share joint checking or savings accounts. "Husband and Wife share a joint savings account and deposit a portion of their community property earnings into the account each month. Sometime during the marriage, Husband inherits $50,000 and deposits it into the parties’ joint savings account. Husband has now deposited his own separate property inheritance into a community property account. Subsequently, the parties purchase several pieces of property using funds from the joint savings account." When Husband deposited his separate property funds into a joint bank account, he created a presumption that the funds are “joint”. The burden is now on Husband and his divorce attorney to establish that any property subsequently acquired with funds from the joint account is separate property. In the scenario above, the parties’ joint savings account is now a commingled asset and cannot simply be divided in half upon divorce. Husband will argue that $50,000 (if still remaining in the account) is his separate property. Further, the character of all property purchased with funds from the joint savings account may be questioned. California courts will typically start with the presumption that all property acquired during marriage is community property. In order to show that property purchased from commingled funds is separate property, Husband must show that when the property was acquired, community property expenses exhausted all community funds in the account. This is a complicated process referred to as “tracing”. 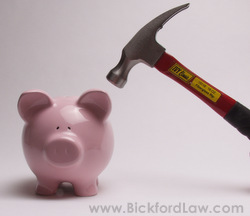 In complex family law cases where large assets are at stake, one party may hire a financial expert to “trace” his or her separate property claims. As divorce attorneys will advise, if a party cannot prove that a specific asset was purchased with separate property funds, then the asset will be characterized as community property and will be divided equally between the parties. Please contact us if you are facing a divorce or a legal separation and have questions regarding characterization of property. Nancy J. Bickford is the only lawyer in San Diego County representing clients in divorces, who is a Certified Family Law Specialist (CFLS) and who is actively licensed as a Certified Public Accountant (CPA). Don't settle for less when determining your rights. Call 858-793-8884 for more information about the divorce consultation process.